At Flextech we don’t believe that a hose is just a hose, we believe they’re much more than that, especially considering how important the role they play is in many process engineering applications. 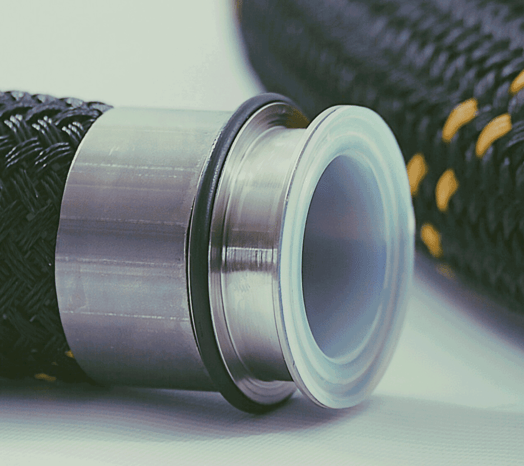 We know that repetitive, arduous applications demand high quality and durable hoses to ensure optimum performance and this is where using advanced hose technology comes in. PTFE is an amazingly malleable material which you can do so many things with! One thing we’re great at doing with PTFE at Flextech is tafting. This involves extruding the liner over the external face of an attached fitting to ensure all wetted parts are PTFE lined. Our USP Class VI grade, platinum cured Pharmaflex silicone hose assemblies use a manufacturing process that allows them to be formed from one piece of material and extruded. Pharmaceutical applications have stringent hygiene requirements which are glorified through this manufacturing method. By combining PTFE hose as a liner and rubber hose as a cover Flextech are able to supply a high performance range of hose assemblies for specialist applications, offering the best of both worlds.